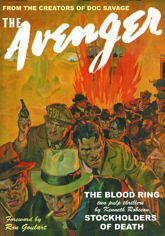 The Pulp Era's most unusual mystery man returns in two epic adventures by Paul Ernst writing as "Kenneth Robeson." First, a famous museum becomes a killing site when an ancient Egyptian curse is revived by a strange ritual involving "The Blood Ring." Then, an unholy partnership between Organized Crime and Big Business produces a deadly trail of murder. Only The Avenger and Justice, Inc. can challenge the "Stockholders in Death." BONUS: A lost Avenger radio script from the Golden Age of Radio! This classic pulp reprint showcases H. W. Scott's classic pulp covers, all the original interior illustrations by Paul Orban and historical commentary by Will Murray.